In 1740 the Baroque period was drawing to a close. Bach and Handel were in the last decades of their lives, as were Vivaldi and Rameau. Music was about to undergo an astonishing transformation over the next 60 years, through the Classical period of Mozart and Haydn to the emerging Romanticism of Beethoven, Mendelssohn and Berlioz in the early 19th century. These musical developments took place during a period of political and social upheaval, with the French Revolution of 1789 taking centre stage, and together they were to affect bow making dramatically. Our exhibition explores the bows of this period and questions the traditional view of the evolution of the bow from the Baroque and Classical (or Transitional) styles to the modern form known today. artefacts, displayed in museums or hidden as curios in bow connoisseurs’ collections. It is true that bow makers lacked social status in the 18th century. In Paris they were not permitted their own guild or even to belong to the luthiers’ guild, and instead had to pay to establish themselves in the lieu privilégié areas of the city, which allowed them to work free of the many guild restrictions. Makers in the lieu privilégié areas had to stamp their work with proof of their address, hence brands such as ‘Leonard Tourte Aux 15 vingts’ and ‘Lefebvre au Cimetière Saint Jean’. 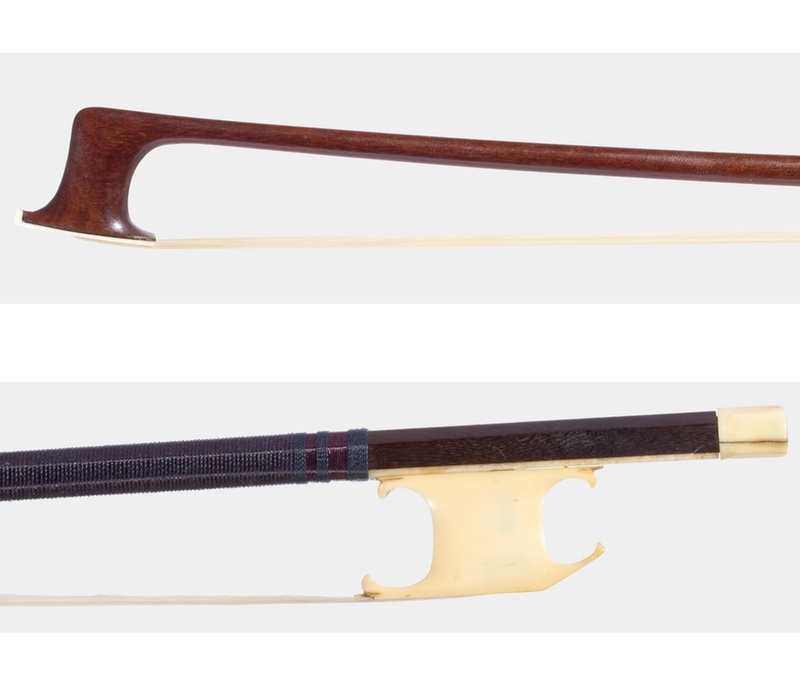 Perhaps as a result, few makers specialised in bows, and workshops such as that of Nicolas Pierre Tourte in 18th-century Paris produced bows alongside instruments. Until the mid-18th century, bows were produced with a different standard of durability in mind. The frog and tip had no metallic reinforcements; buttons were made of organic materials such as horn, bone or ivory; and there was no ferrule before around 1780. Surviving bows are often damaged as a result. Materials for the stick included ironwood, amourette, snakewood, bois de la Chine and bois de corail as well as pernambuco, and the ribbon of hair in the bow was very thin. The sheer variety of bow forms during this period might at first glance suggest it was a phase of experimentation to improve the bow. The length and weight of the stick ranged enormously, as did the height of the frogs and heads – it was a long way from the standardisation of the 19th-century bow. Yet, as we now know, 18th-century bows are actually perfect for the music of their time. They are accomplished, sophisticated creations, each one designed for a specific repertoire and expected only to fulfill this function. 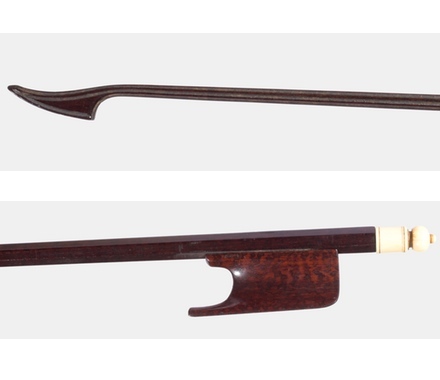 Unlike modern bows, they were designed to resonate rather than project, and consequently had thinner bow hair to avoid dampening the gut strings. Similarly their open frogs created a slight bevel in the hair, rather than a flat ribbon; this helped to produce a less direct attack and allowed the player to create the contrasting accents necessary in Baroque music. 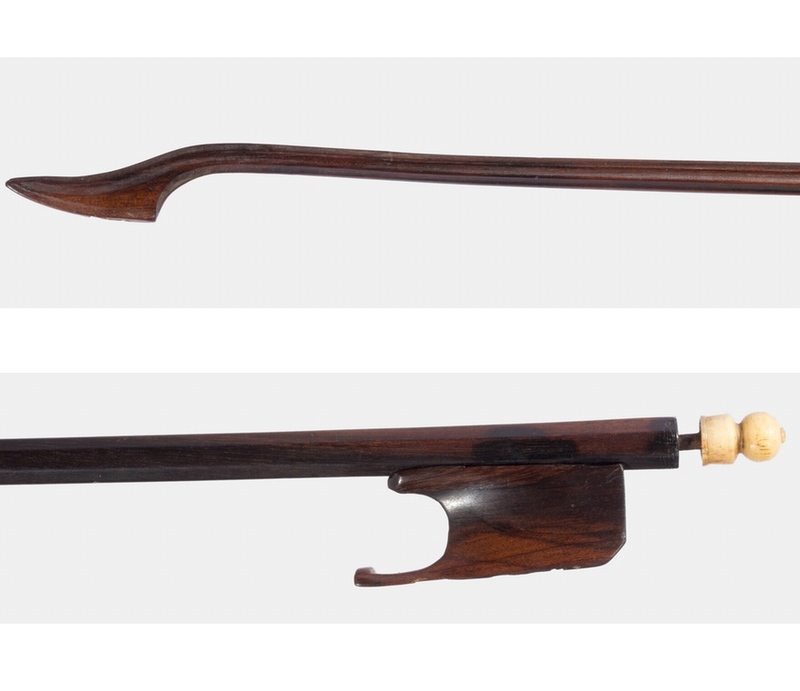 Overall Baroque bows tend to be shorter in length due to the practice of holding the violin quite low on the chest, but the variety in length and weight of surviving examples again suggests they were designed in response to the needs of different repertoire. Shorter bows were probably used in orchestra pits and for continuo, while longer ones could serve for sonatas and solo playing. Particularly short ones were used by dancing masters to accompany their pupils. Some extremely heavy viol or cello bows of around 80g survive. These are likely to have been used for continuo and recitativo, or possibly for the ‘procession’ basses with thick strings, which needed more weight to attack the note. Contrasting French and Italian styles of music also influenced bow production in those countries. The French court from the time of Lully and Louis XIV had a famous tradition of ballet, and French bows before 1750 were mostly designed to play elaborately ornamented dance music with strongly articulated down beats. These bows typically have a pike head that is lower than the frog, while the upper two thirds of the stick is fluted. This created a bow that was much heavier at the heel than at the tip, perfectly designed to play accented down beats and lighter up beats. Italian Baroque music placed more importance upon melody, and Italian bows of the early 18th century tend to be correspondingly longer with higher heads, allowing for more lyricism in the sound. After 1750 the extraordinarily rapid developments in music required both musicians and bow makers to adapt to a quite different performing style. Melody now played a far more important role, concert halls and orchestras became larger, and it became necessary for bows to be able to sustain and project. This was the start of what is now known as the Transitional period of bow making. The most famous Transitional model, the Cramer, was developed in Germany, where the first known examples were used in the Mannheim Orchestra. It was popularised by the violinist Wilhelm Cramer, who is thought to have brought the bow to Paris around 1770. The Cramer model had a head that was stronger, heavier and taller than Baroque bows. The stick was longer and had a concave cambre, reinforcing a trend seen in some late-Baroque French bows. This was the first step towards a bow that could produce a more equal sound at the heel and the tip and was better suited to playing sustained melodies. At the same time, the enormous political changes created by the French Revolution greatly improved the lot of bow makers in France. 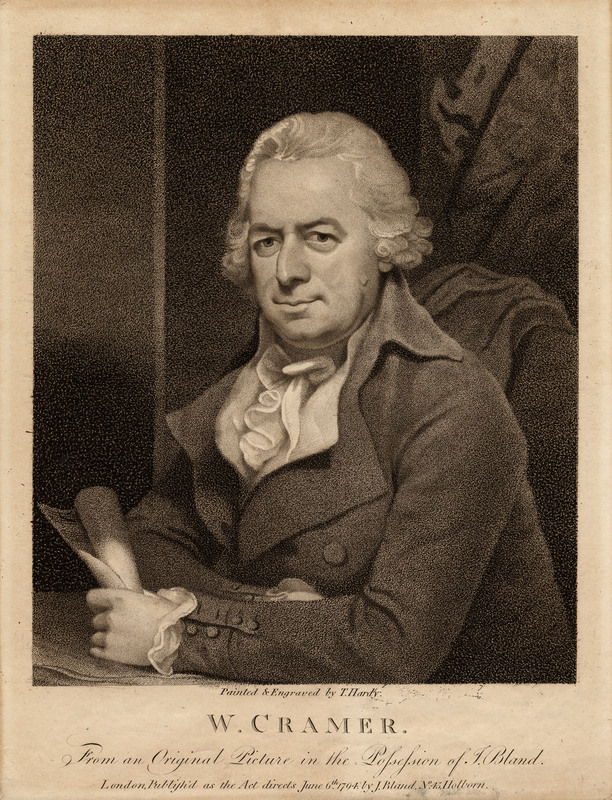 In particular, the abolition of the Parisian guild system in 1791 removed the many guild restrictions, including the rule that had prevented wood workers from using metal, and allowed bow makers to work as equals to violin makers.